5.0 (Based on 20 Reviews) 100% of reviewers recommended this product. This worked perfectly to extend my eyepiece length and allow me to get it parfocal to the camera with a vixen flip mirror. It's a spacer ring. I'm using it to add backfocus to binoviewers being used with an 8-in dobsonian. Sits between the binoviewers and a 1.6x barlow, and the combo allows focus. Works as expected and comes in a variety of lengths so that I could get just enough extension to focus without encountering vignetting. perfect, works great, fits like a glove, nice finish. Inexpensive way to increase existing barlow magnification. Fits well. This is a fine product at a great price. Worked perfectly with my imaging setup to get more FOV with a focal reducer. When I need any type of machined adapter, I check Blue Fireball at Agena first! Excellent fit and finish! Does what it's supposed to do. Solid, no hassle. Review by Hilbily of VA.
Works great on my focal reducer. Review by XRinger of Woburn, MA. My SCB-2000 camera's 1.25" adapter nose piece was too short, because my camera has be pulled back, out of the focuser's draw tube about 0.70". Otherwise it will not focus. The camera fell off the telescope once, saved only by the video cable. Adding the Blue Fireball .75" spacer to the nose piece, insures my camera rig stays on the telescope, all night long! Review by Newt Reno of Northern Minnesota. I shop exclusively with Agena for my accesories; this 1.25 spacer ring was needed for my binoviewers and it does what I needed it to do. Shipping is always fast and the products are always quality! Review by John of Tucson. As an extension for eyepiece. Review by Powerstar8 of Mexico. Perfect finish make this adapter to fit flawlessly. It just work perfect. Review by dvdearden, amateur astrophotographer of Mapleton, UT. I use the spacer ring to get the proper spacing between a 0.5x focal reducer and my CCD camera. This ring threads into the focal reducer and the camera nosepiece simply and as advertised. Review by chris of Ile-de-france, France. Review by Skygeek of Los Angeles. 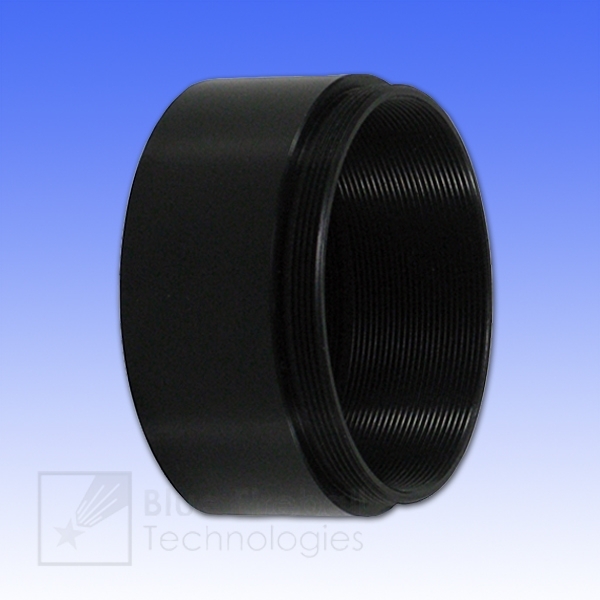 Well made adapter, helpful for reaching focus with some astro cameras or eyepieces. Review by Lannding of Granite City, Illinois. Very useful for astro photography. Review by calastro of California. 5.0 Great product...lots of uses! For what it was intended, this 1" spacer simply does its job and does it well. When used with the GSO 0.5x focal reducer in combination with an eyepiece or with a camera (webcam, video, etc. ), it further deceases the effective focal ratio of the optical system. However, there are some other potential uses for this little accessory. I use mine attached to a LCL-902K CCD video camera with a 1/2" Sony CCD chip. The extension tube alone can be used with the camera to provide a convenient "nosepiece" for the camera to attach to a 1 1/4" focuser. It can also be used with the focal reducer at the front or the back of the Extension Tube. In other words, I can attach the focal reducer to the camera, and then use the tube as a "nosepiece". However, I can also attach the Extension Tube directly to the camera to function as both an extension tube and a nose piece and attach the focal reducer to the front of the combination. If you are modifying a webcam for astro use, it can perform the same functions as both an extension tube with the focal reducer or as a nosepiece for the camera. What else can be said? It does what it was designed to do. It is inexpensive and lends itself to a number of combinations for astro imaging. I really can't see where it could be improved upon! Inexpensive! Does its job well! Doesn't need improvement! For what it was intended, this 25mm spacer simply does its job and does it well. When used with the GSO 0.5x focal reducer in combination with an eyepiece or with a camera (webcam, video, etc. ), it further deceases the effective focal ratio of the optical system.